Chilicotal accommodates a maximum of 2 vehicles and 6 people. This will be helpful Richard. I noticed Chilicotal is not on there. I was wondering recently how many people/cars can occupy that site. I will call and check and post here. 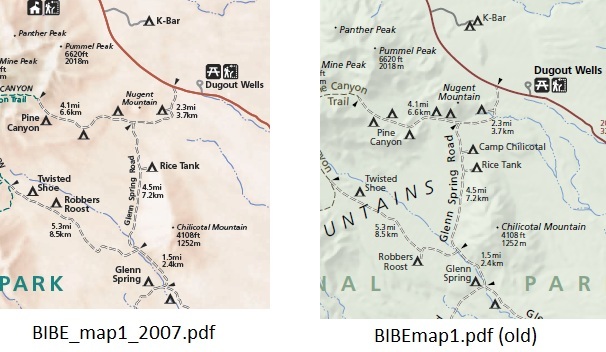 Is there a site at Chilicotal or is it just a backcountry zone (S09)? I believe there is a site not far north of Rice Tank, on the same eastern side of the road. I think it has the word 'Spring' in the name. Maybe Chilicotal Spring? It was taken when we camped at Rice Tank in 2/2012. 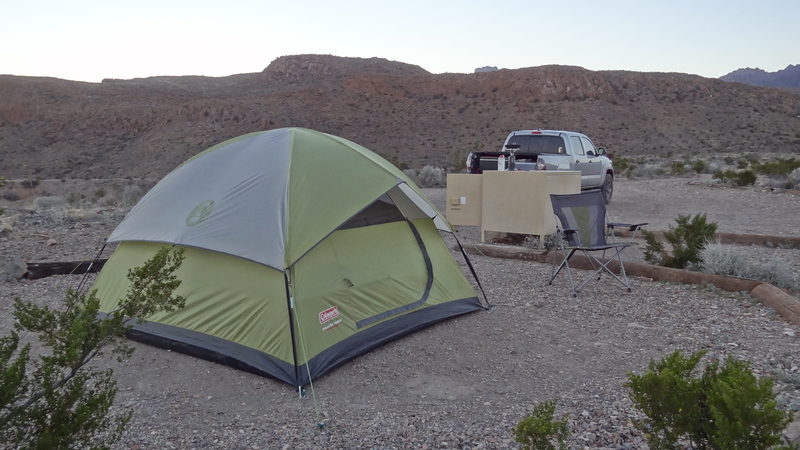 Camp Chilicotal (CC-1) can accommodate 2 vehicles, 8 people, no horses. 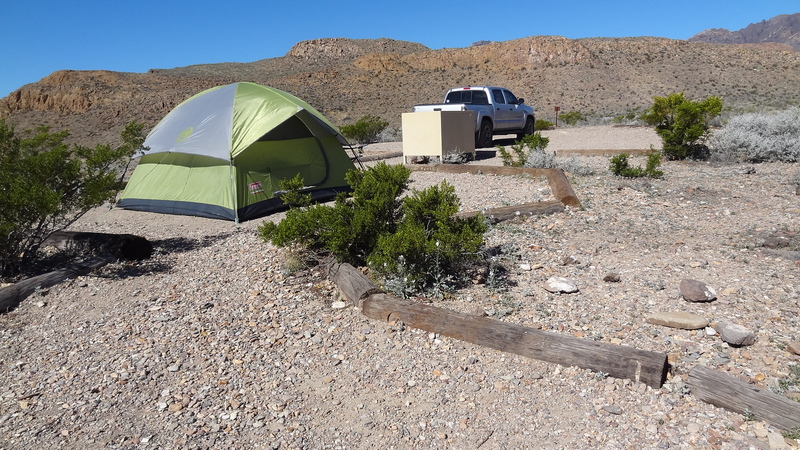 Camp Chilicotal (CC-1) is located along the Glenn Spring Road, approximately 4.1 miles from the northern end. 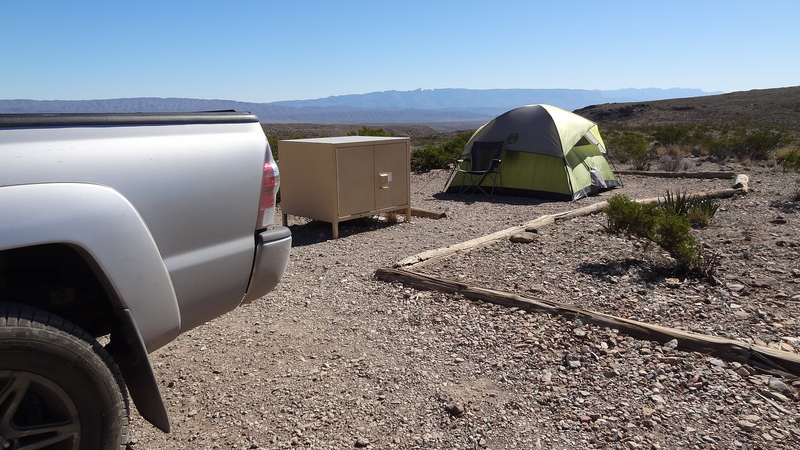 A short access road leads to the campsite. Glenn Spring Road is maintained for high clearance vehicles only. Road is rocky and may become rutted or experience wash-outs, especially after heavy rains. Check with a ranger for current conditions. No shade at this site. The vegetation is sparse grasses and lechuguilla. 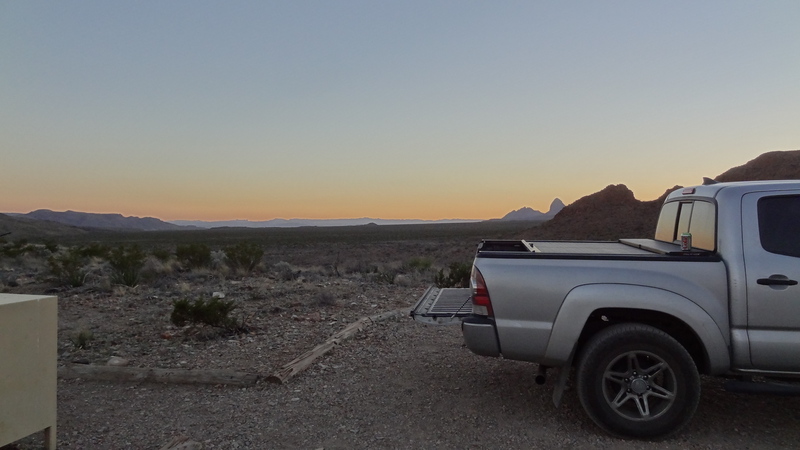 Great views of the Chisos Mountains. 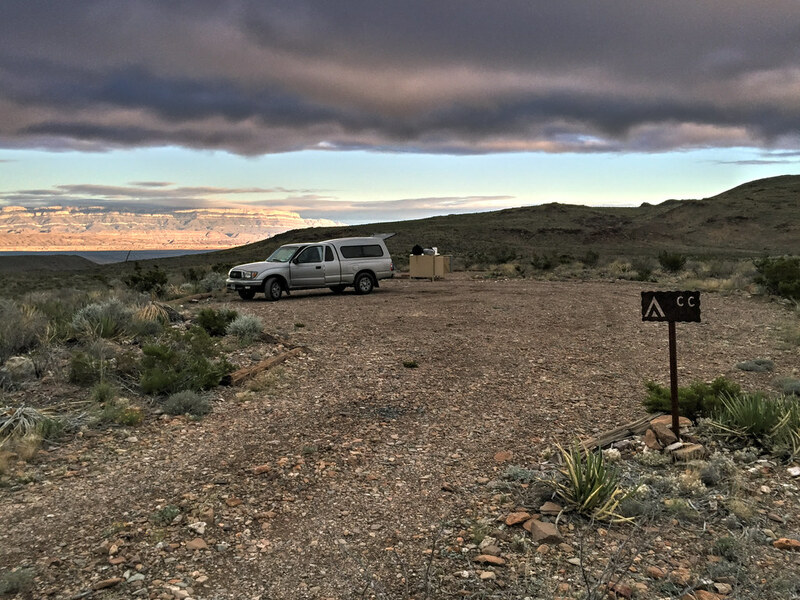 The views of Crown Mountain and the Sierra del Carmen are particularly scenic, especially at sunset. Lock and secure your vehicle while away. Like nearby Dugout Wells, Chilicotal Spring is another desert wildlife water source. The campsite is not at the spring, but you can see the thick vegetation to the east as a clue that water may be found. Like most springs in Big Bend, Chilicotal Spring is only a seep. 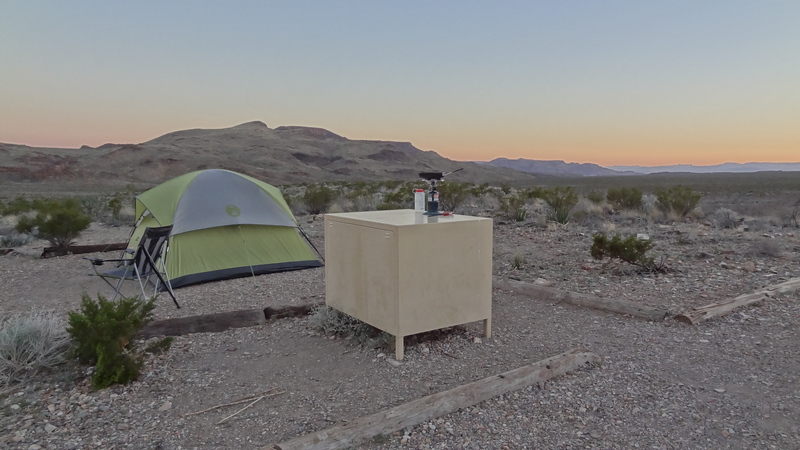 I've camped there. 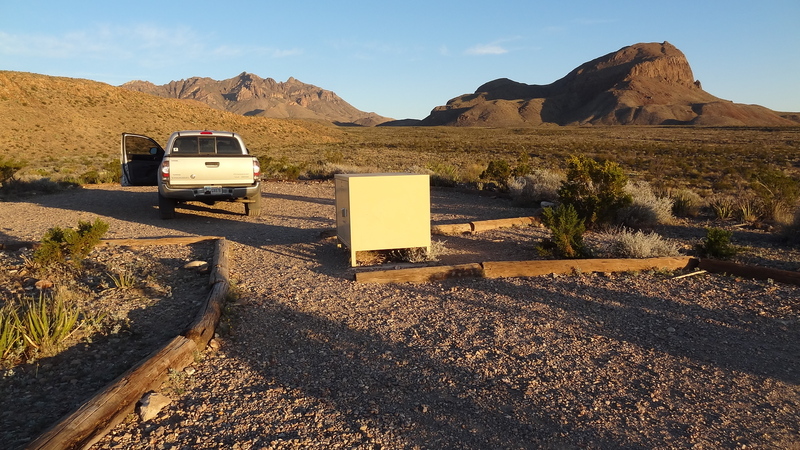 It's on a rise that has some nice views of the open desert to the south, Chisos and Quemada west, and del Carmens east. It sits near the north end of Chilicotal. You could walk from the campsite to the northernmost low flank of the mountain and work your way to the top. Not a short route, but convenient. I did see some car lights coming up from RGV on occasion. Pros: Great views all around. Lots of room for vehicles to turn around. Plenty of room for tents, etc. No one can sneak up on you, since you will have plenty of warning of approaching vehicles. The ground takes and holds stakes well. May see mule deer and/or hear coyotes. Only about 20 minutes from pavement. Cons: Can get pretty windy, since the site is exposed, so recommend using all the guy-lines and solid stakes. People driving by can tell if you are home or not. About 20 minutes from pavement.